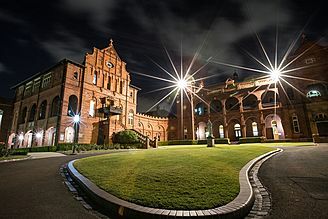 Santa Sabina College is a Catholic School in the Dominican tradition, located in Strathfield, Sydney. Exceptional learning experiences are designed for our students within a contemporary and innovative community. We are committed to education for excellence and justice. As a community founded in the Dominican tradition, our students become seekers of Truth (Veritas) who understand and live out the Dominican pillars of prayer, study, community and service. Offering both the International Baccalaureate Primary Years Programme and Diploma Programme, our school fosters lifelong learning through the development of skills, attitudes and conceptual understanding. Our learners are engaged in challenging and complex collaborative inquiry, demonstrating a growth mindset as they respond to feedback and reflect on their personal learning journey. Fostering our Dominican identity and culture, pursuing discerning scholarship and growing and transforming our community are three areas of focus that reflect the student-centred philosophy of our school. We invite you to explore our website to discover more about our learning community at Santa Sabina. Santa Sabina College has been an authorised International Baccalaureate (IB) World school for the Primary Years Programme (PYP) since 2016. Our school has embraced this global framework, in which inquiry plays a pivotal role. Our students find joy in being puzzled and challenged. Through the PYP, we strive to be thinkers, knowledgeable and courageous as we search for new ways of knowing the world around us. You will see our young students confidently collaborate as they grow into the musician, the scientist, the artist, the philosopher or the explorer of the future. We employ innovative and reflective practices to enable our students to explore a range of local and global issues and develop approaches to learning that will allow them to learn throughout their lives. We empower your children to seek the possibilities, to take meaningful and responsible action. A successful Senior Study experience at Santa Sabina College is not a solo journey. Indeed, teachers and parents work together as partners to provide the best possible environment in which students will thrive. 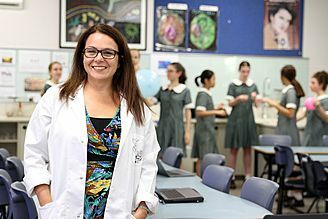 Whether a student chooses the NSW Higher School Certificate or the International Baccalaureate Diploma, she is studying within a Catholic Dominican context. This means that she is a truth-seeker in her academic and wider life. The motto of Veritas will challenge her to think for herself, to engage in respectful debates with those who think differently, and she will reflect on all that she encounters as a Senior Student. Students receive extensive support when making their learning pathway choices in Year 10. There are numerous information sessions for students and parents starting as early as the First Term. Each student will complete a Careers Assessment Test, the results of which will be discussed in individual interviews with student, parents and the relevant College coordinators and councillors. The IB Diploma complements the College’s mission for our students to achieve personal excellence, to act with justice and compassion, and to embrace the future with an optimistic global vision. The IB programme is designed to prepare students to be active participants in their global community, creating well-rounded students with its broad and balanced curriculum. Students will experience components unique to the IB: Theory of Knowledge (TOK), Creativity, Action and Service (CAS) and a research component - The Extended Essay. The Diploma is a stimulating, inquiry-based curriculum that fosters high academic standards and international understanding. The qualification is internationally benchmarked, allowing graduates to continue their studies anywhere in the world. Santa Sabina IB Diploma subject offerings vary to fit the demand of students year to year.